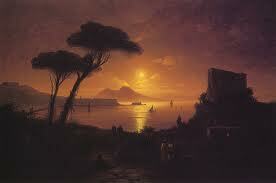 My novel in progress begins in Naples around 1900, in a palazzo on the bay. So I’m looking at images of the time and found this by Ivan Aivazovsky, an astonishingly prolific Armenian landscape painter who lived from 1817-1900. In my years in Naples I never saw quite such a sunset, but it doesn’t matter. The Tahitian sky, the romance of ruined castle, the plane trees leaning, the sun-fires on Vesuvius, sail boats skimming the silky sea, they’re all things to dream on. And those dimly seen people in the foreground, what’s their story?